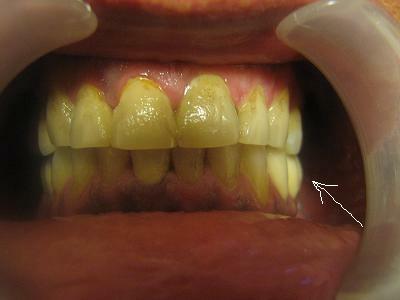 Male, age 45, Cigars smoker, Unhappy with his teeth discoloration. Suffer from occasion pains in left lower bridge. 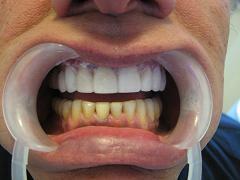 Bonding of 16 Lumineers (Porcelain Veneers) without grinding and later on replacing the bridge with crowns and bridge over implants. 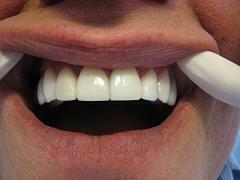 The difference between uppers and lowers is easily visible and the remaining of the bonding materials. 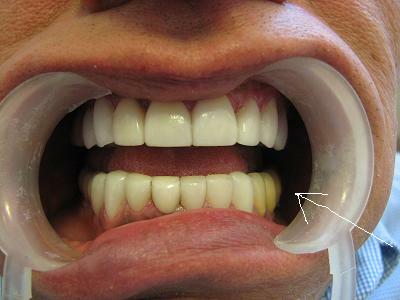 Again you can see the lower bridge (arrow) and its color compared with the rest of teeth.